“A Resource on Jinty” is now five years old! On 16 April 2014 it was launched by Comixminx. 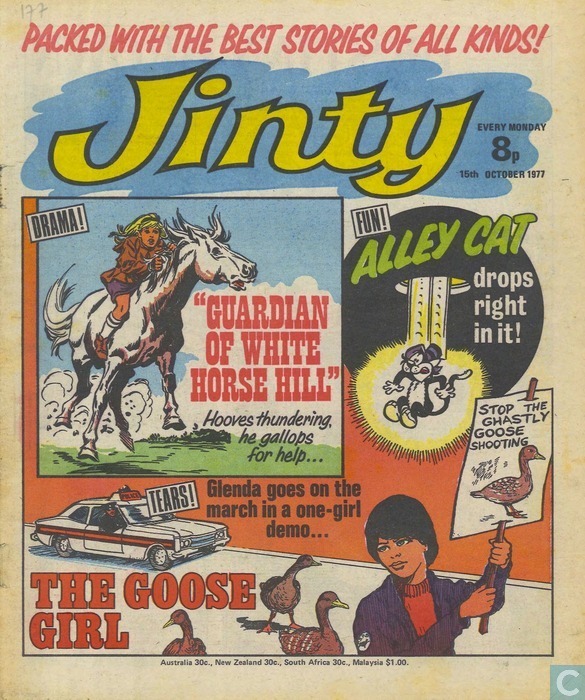 The site was inspired by other resource sites such as Tammy Project (now defunct) and Girls Comics of Yesterday, and queries for help on strips that indicated a resource on Jinty was sorely needed for those wanting help on Jinty scans, issues, stories and other Jinty-related information. “So in this new blog, I want to cover various Jinty-related items. I’ve got quite a few cover images and story pages already scanned which are just languishing on my computer invisible to other people who might be interested; let’s put them up. I’ve got details of individual comic issues which I will index following the lead given by UK Girls Comics, and details of specific stories will follow too. I also want to include sections on specific artists (I’d love to cover writers too but they’re much harder to identify, as Jinty never did run credits for stories). And if I run out of steam or fancy a break, I’ll also either reprint or link to articles relevant to Jinty. It did not take long for me, Mistyfan to join the blog as a co-writer, and I soon proved to be the more prolific one. This was not only in terms of Jinty entries but also in expanding the site beyond Jinty. Tammy, Sandie, Misty, June, Girl II and even Commando have received entries on this site, especially when the entries were in some way connected to Jinty’s history or girls’ comics history in general, or the presence of female protagonists in ways they had not appeared before. Our blog has also drawn a lot of surprises out of the woodwork. Among them are comments and information from former writers, which helped us to expand our credits on stories. The blog has led to contact and interviews with former artists and learning so much more about what went on behind the scenes. We have also received exciting titbits such as scripts of episodes to upload on our site. We even have an upload of very special Trini Tinturè fanart of Comixminx’s family with The Jinx from St Jonah’s. The blog has inspired creativity in other ways. The best example of this was Oubapo, in which demonstrated how former girls’ strips could be re-imagined, either in terms of text or in artwork. We have covered so much on Jinty in the past five years. But we still have plenty of years left and there is still Jinty material we have not yet covered. So is there anything in particular you would like to see on this site? Or do you have any suggestions on how we could develop our site even further? Please let us know. And in closing: HAPPY BIRTHDAY TO OUR JINTY SITE!